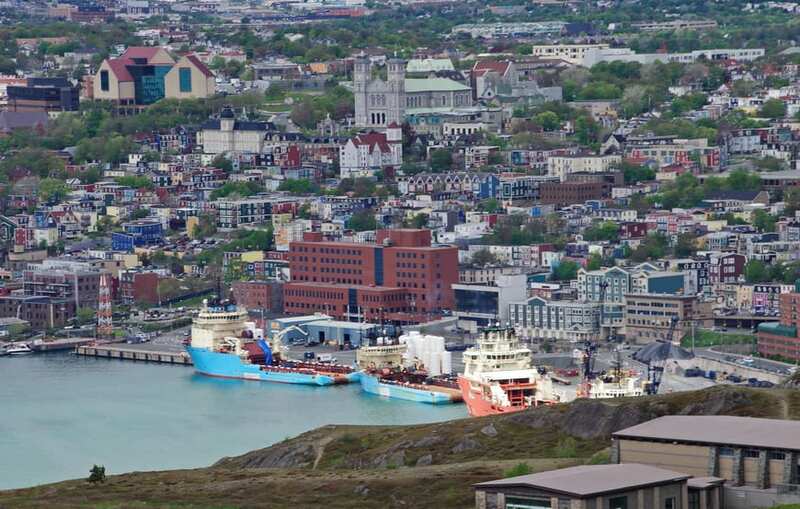 St. John’s, Newfoundland is a fabulous city – colourful, full of character and one with a long history. It seems to be getting more attention these days and well it should. It’s a great destination, especially in the summer. There are loads of things to do within an easy drive of the city – including whale watching and iceberg tours. Here’s another in my series of interesting facts about Canadian cities – this time 28 fun and interesting facts about St. John’s, Newfoundland. St. John’s is the oldest city in North America. And Water Street is the oldest street in North America. St. John’s is the capital of Newfoundland. It was incorporated as a city in 1921. St. John’s is located on the northeastern arm of the Avalon Peninsula. It is the easternmost city in North America. John Cabot was the first explorer to sail into the St. John’s harbour on June 24, 1497. The first permanent residence was established in 1528. The population in 2012 of St. John’s was 200,600. The median age in St. John’s is 39.4. In St. John’s almost 97% of the population reports English as their mother tongue. Only 0.4% report French only as their mother tongue. The St. John’s metro area is home to the offshore petroleum business and accounts for about 50% of the provinces gross domestic product. The worst disaster ever in St. John’s was The Great Fire of 1892. It burned down most of the east end of the city. The first non-stop trans-Atlantic flight took off from St. John’s, Newfoundland and landed in Clifden in the Connemara region of western Ireland. Pilots John Alcock and Arthur Brown won the London Daily Mail prize of £10,000 for their endeavour. The prize was presented by Winston Churchill. Cabot Tower on Signal Hill was built to commemorate Queen Victoria’s Diamond Jubilee and the 400th anniversary of John Cabot’s Voyage of Discovery. Guglielmo Marconi received the first transatlantic wireless message on Signal Hill on December 12, 1901. The test signal was sent from Poldhu, Cornwall, 3,200 kilometres away. On the winter solstice the sun rises at 7:46 AM and sets at 4:11 PM. On the summer solstice the sun rises at 5:03 AM and sets at 9:02 PM. The lowest temperature ever recorded in St. John’s was -18.1°C (-1°F) on March 9, 1997. The hottest recorded temperature in St. John’s was 30.8°C (87 F) on August 7, 1996. The average high temperature in July is 21.2°C (70°F). The average low temperature in January is -7°C (19°F). The largest snowfall ever recorded in one day was 68.4 cms (30 inches) on April 5, 1999. The most rain to fall in a single day was 106 mm on September 18, 2001. October, November and January all average 21 days of precipitation. December averages 10 days with wind above 40 km/h. St. John’s reports an average of 126 days per year of fog. That’s better than Argentia, Newfoundland which averages 206 days of fog per year. Memorial University is the largest university in the Atlantic region with 18,000 full and part time students attending. It’s also a big employer with 950 full time faculty, 750 sessional instructors, 2300 admin and support staff and 2000 students employed in part-time jobs. The oldest continuous sporting event in North America is the St. John’s regatta held on the first Wednesday of August. Saint John’s is the eastern terminus of the Trans-Canada Highway. The Grand Concourse is a walkway network boasting approximately 125 kilometres of walking trails linking the lakes, rivers, ponds, parks and green spaces around St. John’s to the nearby communities of Mount Pearl and Paradise. There are more pubs per square foot on George Street in St. John’s than anywhere else in Canada. Some of the famous people from St. John’s include Rick Mercer, Bernice Morgan, Wayne Johnston, Ron Hynes and Mary Walsh. Try not to get St. John’s, Newfoundland mixed up with Saint John, New Brunswick. I know I always have a hard time remembering which city has the apostrophe in its name. But maybe that’s just me. Do you have any more interesting, fun or useful facts about St. John’s, Newfoundland that you’d like to share? Other posts in my fun, weird and interesting facts series you might enjoy. I’ve wondered what Newfoundland was like ever since I read Proulx’s The Shipping News. I knew it couldn’t be all cod cheeks and bad weather, and now, you’ve made that clear! Great photos, too! Love these facts, especially the one about the accents in St. John’s being identical to those in Waterford Ireland, and the one about the Grand Concourse. St. John’s sounds like it would be a hiking and biking destination. 68,4 cm is a lot of snow. We are complaining about the lasts days’ snowstorm with just 10-15 cm. I’ve yet to read The Shipping News but may have to do so now that you’ve provided such a tantalizing taster of this place. . .and I need to put this on the bucket list! I’ve not been to Newfoundland but it’s been on my list, especially for the puffin and whale watching! @Jennifer There are close to a dozen types of whales I think in he waters around Newfoundland. It’s a fabulous city with a great vibe. I’d love to go back and spend more time in the area. Ever since Candice Walsh did a Meet the Travel Bloggers interview for us and said that it’s her favorite place on earth I’ve been wanting to visit. Love the colorful buildings, not something I expected. @Billie The houses are called Jellybean Row. They’re on very steep streets and as you can see they add a real vibrancy to the city. Hope you make it for a visit. The place has a lot of character. And a tidbit about Saint John, NB – the name of the city is never abbreviated to St. (but the surrounding county and the river names may be). @Steve Thanks for that lesson. Those St.’s and saints can get confusing. I’ll defer to you on the accents. Very interesting facts, Leigh. Many of these are new to me. I had no idea, for example, that St. John’s is the oldest city in NA. @Marcia I love researching these cities because I learn so much too. I certainly need to get here- and all of the Maritime Provinces. @Erik Not so far for you to go and I think you’d love it. Very friendly people too.